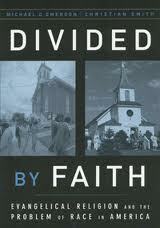 I had heard for quite some time that Divided By Faith: Evangelical Religion and the Problem of Race in America, by Michael Emerson and Christian Smith, was the seminal work on race in the American church. And while I began reading it with high expectations, the authors failed to provide a convincing argument. The book was full of many useful statistics, anecdotes, and themes, but Emerson and Smith failed to tie it all together in a meaningful and persuasive way. The central thesis of Divided By Faith is twofold: we live in a racialized society, and, despite good intentions, Evangelicals actually make the problem worse, rather than better. By “racialized society,” the authors simply mean that we live in a place where race still matters “for life experiences, life opportunities, and social relationships,” opting for this term over the more common phrases of prejudice or racism. But even here, we do not get a clear explanation of why it matters that we live in a racialized society, at least not from a biblical perspective. They point to problems such as income disparity, education differences, and de facto segregation—all of which are certainly bad things—as proof of our racialized society. But what they never tie together is the idea that these bad outcomes are the result of racialization. Secondly, Emerson and Smith say that Evangelicals make the problem worse by having access to a limited “toolbox” from which to draw solutions to this problem. White evangelicals, the authors find, focus on freewill individualism as the chief explanation for the difference in outcomes between whites and blacks, while African Americans point to structural problems, spiritual warfare, and incipient racism as the reason for inequality in America. Additionally, they find that the more time a white Evangelical spends with African Americans, the more likely he or she will cite structural problems as well. Here again, unfortunately, we see Emerson and Smith’s inability to tie loose ends together. Both explanations may very well be true, or perhaps only one or the other is correct, but instead of making a convincing case as to why one is right and the other is wrong, the authors just assume that the explanations African Americans give are correct. Let me be clear, I am not saying that that is not the case, I simply wish that Emerson and Smith would have done a better job proving their thesis. The second half of the author’s thesis—that white Evangelicals make the race problem worse—is initially harder to swallow, but interestingly, this is actually the strongest part of their work. The problem is clearly stated in their description that, following the civil war, whites and blacks went from sitting in separate pews in the same church, to attending different churches entirely. This is due to the fact that in a free market such as ours consumers choose the product that fits them the best. In the church world this means that parishioners will attend the church that is the easiest fit for them; the one with the least amount of friction. Since inter-racial relationships carry with them a certain amount of friction, the authors assert, races will tend to congregate together. This then strengthens the bonds that already existed between people of the same race, only furthering the de facto segregation that exists in America. It is from these relationships that better jobs can be acquired, along with a host of other economic and social benefits. Therefore, separate churches only add to the disparity between the races. Overall Divided By Faith was certainly an interesting read, and while they failed to convince on many points, the book was thought provoking enough to make it worth the time. No one can deny that, while things have certainly improved, the race problem in America is still an issue that needs to be dealt with, especially for the Evangelical church. Let us all pray that as we continue to grow in Christ, we would grow closer to racial reconciliation in the Church.